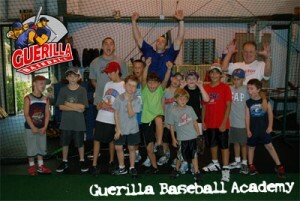 Guerilla Baseball will hold a “Back to School” camp the last week of July. The camp will run the 28th, 29th and 30th of July. The price for the 3 days is $99. The camp will be from 10am – 1pm each day of the camp. The camp will cover hitting, fielding, throwing and pitching instruction along with a competitive Wiffle ball game to end each day. Awards and Prizes will be give out. The MVP of the camp will be given a free month of Guerilla Baseball Classes. Guerilla Baseball has a Hitting class Monday – Friday from 4-5pm and a Throwing/Fielding class Monday – Friday from 5-6pm. If you are interested in attending the “Back to School” Guerilla Baseball Camp please contact us by calling the number above and reserving a spot. We need at least 8 players to hold the camp so get the word out we would appreciate the support. When attending the camp please bring sneakers along with a bat and glove. You can bring drinks or a snack during the camp. Guerilla Baseball has drinks for sale as well. Sign Up Today to reserve your spot! This is our last event before the new school year.